This week's EBSQ's Art of the Day sets sail with seven days of art featuring ships and boats. "It is 'race day' in Olympia's (Washington) Budd Inlet. The Mary L is ready to take her place at the starting line for the annual Harbor Day's tugboat races." 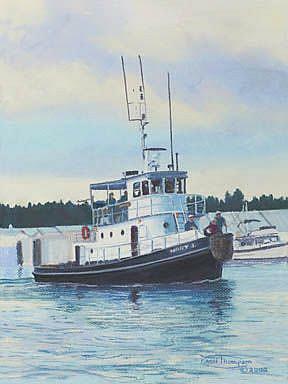 Artist comment: "I have done a series of tugboats from a recent Olympia Harbor Days tugboat race. This one, the 'Mary L', was getting into position at the starting line. I used pastel on Canson Mi-Teintes paper to achieve the soft clouds and yet accomplish strong darks."